I met a quilt designer on the 'Net and occasionally she asks for people to beta-sew her designs before she makes them commercially available. This is the 2nd quilt I've beta-tested for her. 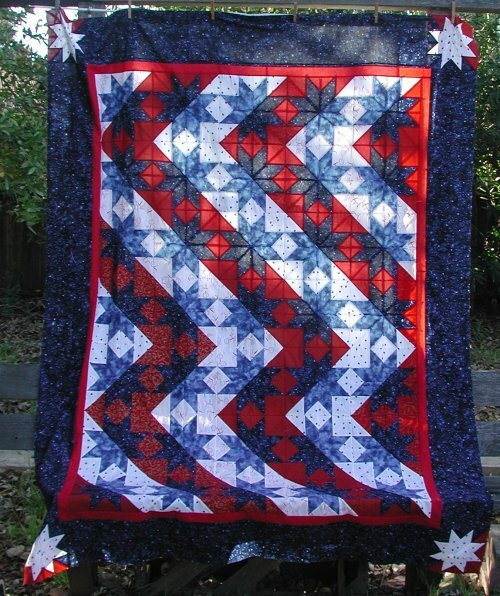 She calls it 'Stars & Stripes Forever' and is available in a wall hanging and twin size quilt. The designer Marj Rhine and her website is at Quilt Designs NW. I decided that I was going to use fabric from my stash to make the twin size quilt and mostly I achieved this goal. The reds were from a previous wall hanging made in 1995 (Jane Kowalski's quilt). They are reds with different gold metallic designs. One white is a homespun-sorta weave, i.e. looser than the cotton, but I liked it anyway. Unfortunately, I didn't have enough to do all the white zig-zags in this fabric, so I bought another white that reads the same from a distance. The blues were a recent addition to my stash, although not specifically bought for this project .. however, I discovered that I was going to run short of the dark blue (which was also going to be used for the outer border), so a quick trip to the fabric store for additional supplies was in order! The result is that the red zig-zags are of different design reds; the white zig-zags are of different design whites, but overall, it reads as a simple red/white zig-zag. I'm pleased with it. Because this was such a special quilt for me, I decided that would indulge myself and take it to a local longarm quilter who's work I adore, Janna Bailey of The Quilting Company, Walnut Creek, CA Although the photo above is of the top only, I did eventually get it quilted (beautifully, by the way) by Janna. I must remember to take a picture of the final quilting.